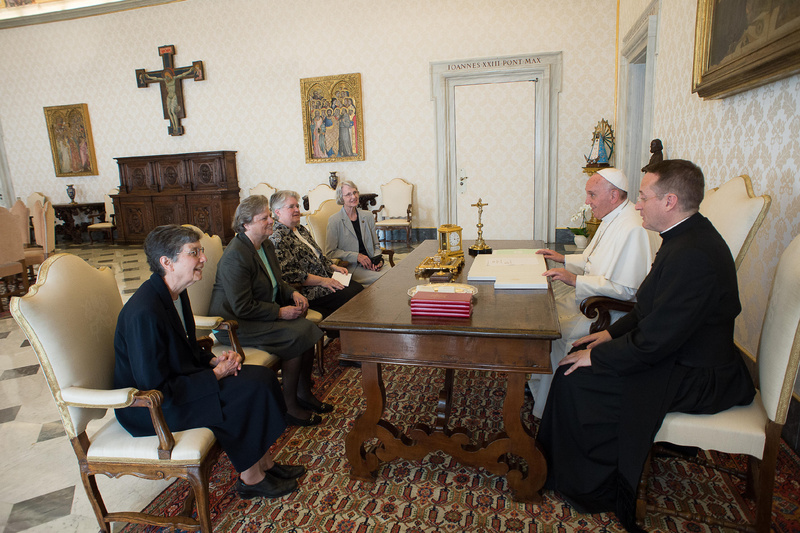 Pope Francis spent 50 minutes with a delegation from the Leadership Conference of American Women Religious (LCWR) today, after the Vatican’s Congregation for the Doctrine of the Faith (CDF) and the LCWR announced, in a joint report, that they had reached a positive conclusion to a three-year effort by the congregation to ensure that the LWCR carries out its work in harmony with the Catholic Church’s teaching. This ended, on an amicable note, a highly controversial process involving the CDF and the leadership of the umbrella organization of over 80 percent of the 57,000 American sisters that had made international headlines. “We learned that what we hold in common is much greater than any of our differences,” Sister Sharon Holland, president of the LCWR, commented afterwards. It had been known for some time in Rome that Pope Francis wanted to bring closure to this contentious and unhappy chapter in the relations between the Vatican (spurred on by some U.S. bishops) and the LCWR, and to open a new, positive and constructive relationship with the sisters. This has now happened. An earlier positive conclusion in December 2014 to the investigation ordered by the Congregation for Consecrated Life, started under Cardinal Rode, into the different orders of American sisters, sent a clear signal that a similar constructive conclusion would also be reached in the not too distant future between the LCWR and the CDF. It said Cardinal Gerhard Muller and other CDF officials together with US archbishop Peter Sartain (whom it had appointed to oversee the assessment) met today, April 16,with four officers of the LCWR—Sister Carol Zinn, S.S.J., Sister Marcia Allen, C.S.J., Sister Joan Marie Steadman, C.S.C., and Sister Janet Mock, C.S.J. The Vatican appointed a kind of "special administration" for the LCWR, headed by US Archbishop Peter Sartain of Seattle. He was designated as “the delegate in charge of examining, guiding and approving, in necessary, the Association (LCWR)’s work.” He was charged to work with LCWR representatives “to fulfil the objectives outlined in the Assessment,” and to oversee the work of reform, including revision of the LCWR’s statutes, program planning and the revision of liturgical texts. His mandate was to last five years, and then he was to report back to the CDF and to the Congregation for Institutes of Consecrated Life and Societies of Apostolic Life. Sartain was to be assisted by two other US bishopsLeonard P. Blair and Thomas J. Paprocki. The Joint Final Report stated that after “mutual learning” and “refining several drafts”, it was agreed that: “the role of the Conference as a public juridical person centered on Jesus Christ and faithful to the teachings of the Church is to undertake through its membership and in collaboration with other sisters those services which develop the life and mission of women religious in responding to the Gospel in the contemporary world” (Statutes, Section 2). These revised Statutes, approved by the LCWR’s 2014 Assembly, have reviewed by the CDF and approved by the Vatican’s Congregation for Institutes of Consecrated Life and Societies of Apostolic Life. The Joint Final Report said: “The choice of topics and speakers appropriate to the Conference’s mission and service will be carried out in a prayerful, thoughtful and discerning manner” and—as with written publications—"LCWR expects speakers and presenters to speak with integrity and to further the aims and purposes of the Conference, which unfold within the wider context of the Church’s faith and mission." It said Cardinal Müller offered his thoughts on the Doctrinal Assessment, the Mandate and its completion, and “expressed gratitude to those present for their willing participation in this important and delicate work." O'Malley said the investigation was a disaster so obviously the Vatican had to get it out of the way before the Pope's visit. O'Malley has also said that something needs to be done about accountability in the case of bishops like Finn. So hopefully the Vatican will also get the accountability issue settled before the Popes visit too. I don't think we should be handing out awards to the Vatican on these issues. Let us pray that this is one in a series of necessary changes in the governance of the Church and in the pastoral application of many moral teachings. It is a great day for the LCWR and for all Catholics. On a lighter note, much of the response from the secular media demonstrates how clueless they are on things Catholic. The funniest is from Slate, who has twice affixed photos of young (20-something) habit-wearing nuns to their stories on the LCWR controversy. Note (http://www.slate.com/search.html#search=lcwr) the story of April 2013 had Missionaries of Charity and now its the Sisters of Life - of course, neither are members of the LCWR. They are members of the Council of Major Superiors of Women Religious. At least they issued a correction this time.